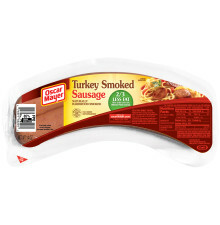 Oscar Mayer Natural Uncured Roasted Peppers and Onions Sausage helps you create a meal you can feel good about. With no artificial preservatives and no added nitrates or nitrites, you get all the rich, robust flavor you love with nothing you don't. The perfect addition to lunch or dinner! 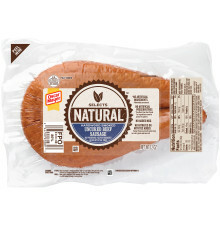 PORK, WATER, ONIONS, RED BELL PEPPERS, CONTAINS LESS THAN 2% OF SEA SALT, GREEN BELL PEPPERS, SUGAR, CULTURED CELERY JUICE*, SPICES, NATURAL FLAVOR, AUTOLYZED YEAST EXTRACT, MALTODEXTRIN, CHERRY POWDER. MADE USING A BEEF COLLAGEN CASING. *INGREDIENT USED TO PRESERVE QUALITY.